It was another solid quarter of growth for Alibaba. Revenue jumped an incredible 32% year over year. 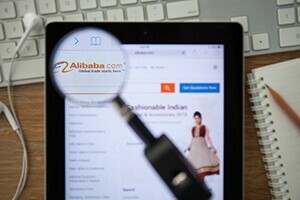 Gross merchandise volume – the total amount spent over Alibaba's platforms – was up 28% from the previous year. The company also reported having 386 million annual active users. To put that number in perspective, the entire population of the United States is just 319 million. But the biggest reason the Alibaba stock price is climbing today is the company's mobile share. Roughly 62% of all transactions now happen on mobile devices. Alibaba has continued to invest heavily in mobile growth, so sustained growth is crucial to the Alibaba stock price. "It beat expectations on mobile, so it really bodes well for the future of the company," Summit Research's Henry Guo told The Wall Street Journal. "Because increasingly customers use mobile to make transactions, that is really the key here."